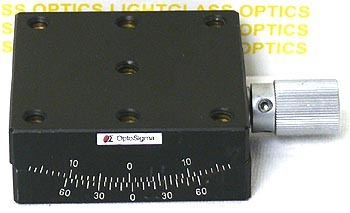 This OptoSigma 123-2820 Single Axis 65mm Goniometer has a 65mm square top, which has been drilled and tapped to accept 1/4-20 fasteners at the corners and a 1/4-20 in the center. Made of precision machined brass, this has a height of 24mm tall, and a center of rotation height of 76mm off the top of the stage. Imagine a point in space 76mm high from the top of the stage. This is the center of rotation. The 123-2820 has a travel of 30 degrees, with a resolution of 5 arc-minutes.